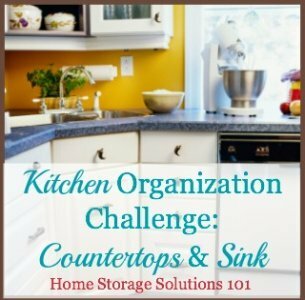 This week's challenge is all about kitchen organization, both overall and with specific emphasis on keeping your countertops and sink clear and clean. The reason I chose this challenge as the first of the year is because keeping your kitchen organized (and functional) is so important to keeping our whole house running smoothly, and can have such a positive impact in our lives. So, let's start the new year off with a bang and really do something that has a big organizational impact. This will help keep us motivated to continue on with the rest of the challenges, and start seeing the positive results of our efforts right away. Are you new here? 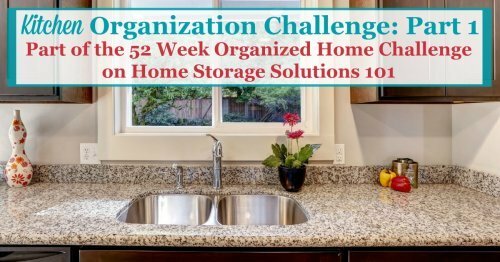 This kitchen organization challenge is part of the 52 Weeks To An Organized Home Challenge. (Click the link to learn how to join us for free for future and past challenges if you aren't already a regular reader). Before we dive in to action for the kitchen organization challenge, let's make sure we're headed in the right direction to best suit the needs of our home and family as we organize. That means we need to consider how we currently use our kitchen, either intentionally or unintentionally, and how we want to use it in the future. Your kitchen can have as many functions as you want, as long as there is room for all of them, and you plan to use the space in that way. However, be very careful to make all of the functions of this space intentional, since this is the real key to kitchen organization. For example, if your kitchen is a dumping ground for keys, mail, and other stuff that comes in the door you should consider if you really have room for this, and whether this is working for you. If you want to have your space used for this function make it intentional, by adding a bowl for keys, or a file for bills and mail to respond to, and create systems for keeping up with the stuff on a regular basis. On the other hand, perhaps you decide you should eliminate a function from the kitchen, because you don't have room for it there anymore. Then, in that case make a space somewhere else in the house to do that task. For example, if having the kids do homework in the kitchen is causing dinner time chaos, then create a homework center somewhere else in the house so the default location is not the kitchen table. Obviously, the functions that can only happen in the kitchen, like cooking, need to have top priority for the space, with other functions being added only if there is enough space for them too. Once you've decided how you want to use your kitchen you can begin taking action to meet those goals, and to take control of the space. This week in the kitchen organization challenge we'll focus on counter space and keeping your sink clear, and focus on other areas later in the challenge. (If you're interested check at the bottom of the page for a sneak peek for the upcoming weeks' challenges related to the kitchen). There are two main reasons why keeping your counters (mainly) clear is so important to home organization. The first is that you need clear counter space to do many different cooking activities. Since this is the primary function of a kitchen you need space to do these tasks. The second is more of a mental reason. Seeing clear space, instead of cluttered space, is much more calming and can keep you from feeling so stressed when you enter the room. Please note, however, that I am talking about mostly clear counters, not completely clear and empty space. I am not trying to get you to live a spartan existence where it doesn't look like anyone lives in your home. Instead, you should have a few, well chosen functional, beautiful pieces that are used frequently on your counters. It should just most likely be less stuff than you currently have there. Once you've decided what the functions of your kitchen and its counters (or kitchen islands) you can remove any items that don't fit those functions. For example, if you've got stacks of paper everywhere, but you've decided that your home office is a better place to store these things long term, or where you'll deal with them each week, then remove them from your counters and table and place them where they should go (or your can create a home mail organizer center for incoming papers and mail). In addition, make a plan for how you'll get those items to their true designated home from now on, on a regular basis (most likely, daily), so the same types of stuff don't start re-accumulating. Removing all the stuff from your counters that doesn't belong is really the easy part of this kitchen organization challenge, or what I like to call the low hanging fruit. You know there is a better place to put that stuff in the future and you create systems to make sure it gets there, instead of back on the countertops. On the other hand, what about all the stuff on your counters that does deal with cooking, for example, like small kitchen appliances? 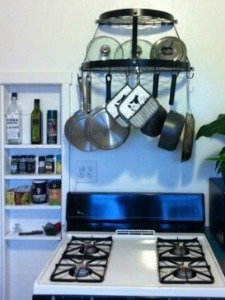 These can be harder to deal with because they "go" in the kitchen, but they take up so much space that they make it hard to actually use the kitchen for cooking. These are the types of items where you need to start really thinking about how often you use them, to know if they deserve a spot on the counter or not. Definitely, if you have room, keep out appliances that you use daily, like a coffee maker or toaster (if you truly use them daily). Depending on the size of your kitchen, you may even decide you have enough room to keep out appliances you use on a weekly basis. 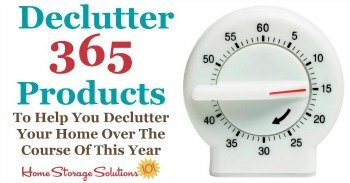 For a detailed list of which of the 15 minute decluttering missions pertain to this room of the house check out the getting rid of kitchen clutter hall of fame, which also has inspiration of what others have accomplished with these challenges in their kitchen. In addition, I've written an article specifically about decluttering small appliances here which you can read. On a daily basis your kitchen table may be used for many functions. Obviously you eat at it, but it also tends to be where we do paperwork, the kids do homework, and more. That's part of life, and isn't something to be discouraged. But it is a pain when the table is full of clutter and stuff that doesn't belong there when you want to do another activity. Here's a short article on this daily habit, which also includes several pictures of readers cleared kitchen tables as inspiration. 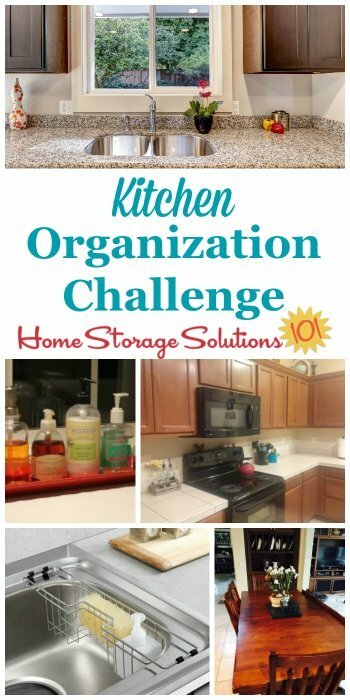 I know this is more to do with cleaning up than kitchen organization per se, but hear me out about why I'm including it in the kitchen organization challenge. When you've got dirty dishes in the sink it is kind of like an invitation to dump junk on the counters, since the kitchen is dirty anyway. I've often heard this symptom and effect called the "broken window syndrome." The idea is that if there's one broken window that does not get quickly fixed, then the rest of the neighborhood will quickly go to pot, since the thinking is no one cares what it looks like. I don't want you to have to be the dirty dishes police, always calling people out for the stray bowl in the sink. Therefore, I think a reasonable habit is to make sure the sink is cleared out twice a day, such as after breakfast and dinner (or bedtime), while you (or a loved one, or child) is doing the normal kitchen cleaning routine. 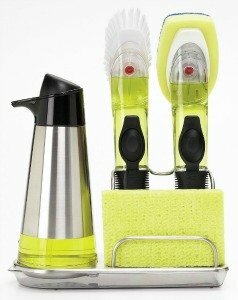 To learn more about daily tasks for the kitchen you can read my article about kitchen cleaning tips on the sister site, Household Management 101. In addition, you can learn more about creating a house cleaning schedule for your entire home, in a later Challenge. Once you're regularly washing dirty dishes, pots and pans, you can look at your kitchen sink area, and perhaps declutter some items from the space, such as excess or old sponges and scrubbers, dish soap bottles, dish drainers, or other items. You can check out this article about how to declutter your kitchen sink area for more tips for this task! Finally, several readers who've already done this challenge have shared their really awesome kitchen sink organization ideas and storage solutions, which I put into a hall of fame. If you need some inspiration, come check it out. 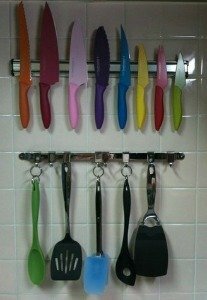 I would love to know how this week's kitchen organization challenge is going. You can tell me your progress or give me more ideas for how you've organized this area of your home below in the comments. I also love before and after pictures, and would love to see some of yours. Submit your pictures (up to four per submission) and get featured in the Creative Storage Solutions Hall of Fame. You've worked hard to get organized, so now here's your chance to show off! We're working on our homes slowly, one area at a time, so don't get too distracted from the first part of the kitchen organization challenge, which I've designated as dealing with your countertops and sink only. However, I want you to know that we're focusing on the kitchen for a couple of weeks, so you don't have to do it all this week. Instead, next week we'll focus on organizing kitchen cabinets, cupboards and drawers, and the following couple of weeks will be devoted to food storage areas. Since the kitchen needs so much organization and constant attention, because it is used so often, I've given us plenty of time to get it done. As a final note, I wanted to thank each of you, from the bottom of my heart, for joining these challenges with me. There are now over 155,000 people signed up for email alerts! That seems amazing to me. I've heard from so many of you already expressing your excitement to get started and make 2019 a great, clutter free and organized year for yourself, your home and your family. I am honored that you'd let me help you with this goal, and I don't want to disappoint. I am also honored when and appreciate receiving tips and more organization ideas from you wonderful women (and men), who have such creativity, passion and design sense. My hope for this site is to make it a community where we can all share ideas about what's working, and brainstorm ways to fix areas that aren't in our homes, especially as it deals with organization and storage. The beauty of home organization is that there is no one "right" way, but many ways that may work. I love that! If you're enjoying these challenges, and know of someone else who may also benefit from them I would really appreciate you passing the link on to them.